Lasciati andare (Let yourself go) is a classic example of an Italian screwball comedy. 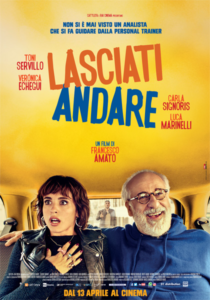 There’s the older, more affluent and educated Elia (Toni Servillo), and the pretty young screwball Claudia (Verónica Echegui) who challenges his masculinity, social status, and general sense of well being, leading him on a merry chase around Rome that changes his life. It is about a Jewish psychoanalyst who lives and works in the Roman ghetto. He is separated from his wife Giovanna (Carla Signoris) but they remain close and live next door to each other. Settled into a stodgy, predictable existence, his comfort level is disrupted when his doctor tells him he’d better get in shape, or else, and so he joins a gym. As Elia struggles to get acclimated to the high-energy world of modern fitness centers, he hires young trainer Claudia to get him up to speed. Claudia’s life is…complicated…and getting Elia in shape becomes increasingly important as they are running from young thug Ettore (Luca Marinelli), who hid some stolen property and can’t remember where.